With valuations pushing their upper limits, stock selection has become even more important. 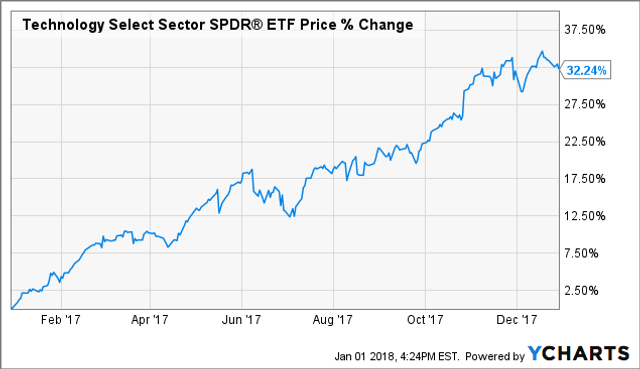 The technology sector has had a banner year in 2017, rising >30% (as shown by the S&P 500 Technology ETF (NYSE: XLK) chart below) and beating every other sector, including ~20% gains in Financials, Materials, and Consumer Discretionary. While the rally in technology shows no signs of cracking - unlike the dot-com era, stock prices are rising in tandem with top and bottom line growth - it would be wishful thinking to assume 2018 will be as kind.